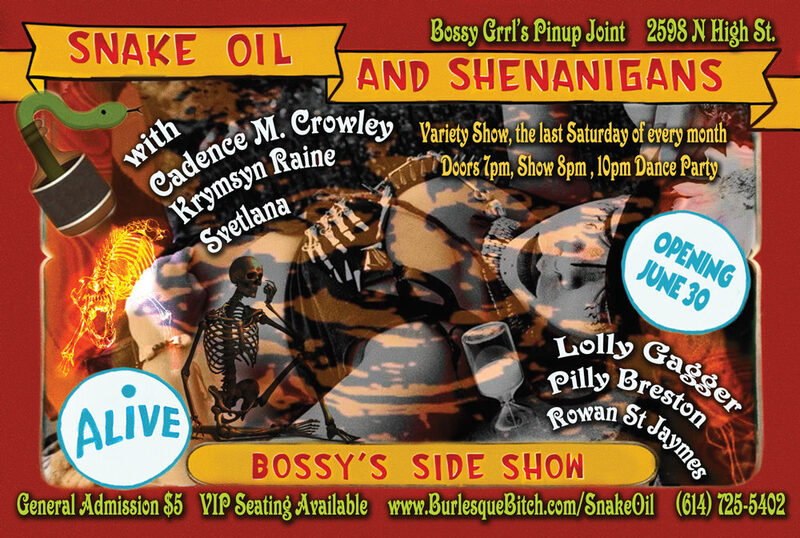 New show coming to Bossy Grrls, Cadence Crowley, known for her stunning fire acts, brings a unique variety and sideshow experience to High street. It's outlandish, it's shocking, it's indescribable! General admission - $5 gets you in the door to the weirdest Saturday in Columbus. This ticket does not promise a seat, it is first come first served, but for those who like to mingle, it's the best choice! VIP Seating - $10 gets you seats in up front, in our seating section. The splash zone! You'll feel the heat and have the best view, in one of the best seats in the house to view the show! Group - $50 gets you tickets for up to 10 people, great for bachelor and bachelorette parties! Birthday parties! or just a group out on the town on a Monday! Your group will get two table tops reserved or based on availability a special section reserved for you, first come first served. This article was added to Burlesquepedia on Jun 03, 2018 and was last modified on Aug 14, 2018.